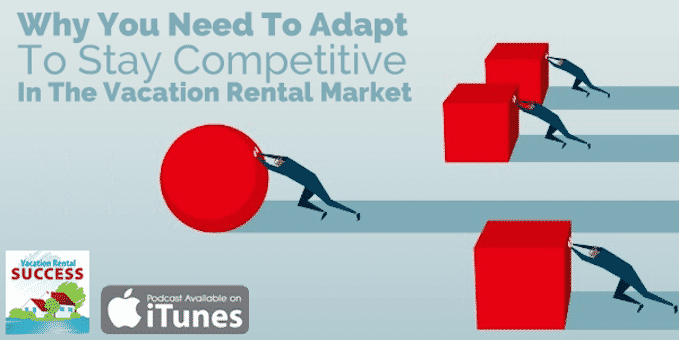 Every business has to adapt to changing times and our vacation rental business is not immune. Customer expectations and perceptions can change rapidly due to media and peer influence and we have to keep up to stay competitive. We find this constantly in our rental agency business as issues arise over the course of a busy summer. And most times it could. the way we operate, and the way we communicate with guests. Because….every time your guests feel something negative about your property it will impact whether they come back to it as a repeat guest, how they review it online, and how they share it with their social networks and friends in the real world. In this episode, I discuss some of the issues that are impacting the vacation rental market in our part of the world and how we adjust and adapt our business practices from what we operationally do, to how we perceive our rental guests, their needs and realities in today's market. By sharing some of our experiences on a very practical level in three areas, I’ve teased out the adaptations we’ve had to make to accommodate the changing nature of the business. When incidences of collapsing beds, cracked toilet seats, and damaged patio chairs rise as they have over the past couple of years, we need to look at the causes, and ways to mitigate this type of issue. It’s not through charging guests for damage, and arguing they should have been more careful with our furniture – it’s through reinforcing bed frames, looking carefully at weight limitations on the furniture we buy, and accepting a higher level of risk. And having a couple of replacement toilet seats handy. When I hear an owner respond to a complaint with…. ….it sounds like there isn’t a checklist to follow, and given our guests are less tolerant and forgiving than they used to be, getting a stricter cleaning structure in place is so important. We should not need to adapt our methods in order to improve cleaning standards because these should be high anyway, but I am first to admit that occasionally things get missed. So, I’m trialing the app from Properly and would love to hear from anyone else who is using it and getting results. Much as we’d just like to say “I am so sorry – this is not a hotel. It’s a rental cottage located 15km down a dirt road, and nearly 30km from the nearest town where the caretaker lives, and he was not able to come out at nearly midnight to replace a DVD player,” we simply apologized and made a mental (and physical note) to manage guest expectations better. We’ve had midnight calls because the DVD player is not working, or they can’t figure out how to get the microwave to do popcorn, or someone is stuck in the shower! So, we now have a section in our ‘Things You Need to Know Before You Go’ document that outlines what will happen if things go wrong. There’s always been something like that, but it’s been a little vague as to what might go wrong, so we’ve adapted it to meet the higher demands of guests used to calling down to the front desk. If you don’t have an on-site concierge or a Property Manager who can whip down to the place less than 30 minutes after the call to fix a blown light bulb, you need to set expectations. Interesting insights, Heather and it brings very much into the fore the importance of anticipating guests’ requirements, rather than managing guests’ expectations. As you allude to, the guest has an ongoing higher level of expectations, brought about with the growth in valued added services. To be one step ahead it is a matter of being creative in providing something which the guest hasn’t even expected/anticipated – this is where the true wins occur. It certainly is a lot of hard work, in particular in countries/regions where there is not a service mentality and staff require intensive training. I spend a large amount of time when I overhaul my properties constantly working on staff manuals and training staff (Latvia). I also stay in the properties and test everything out. A very important piece of advice I received from Sally Shalam, Travel writer for the Guardian, UK when she wrote a feature on my property in London. I am blessed to have guests who have not damaged anything of significance and the properties have very expensive home wares in them as well, which guests appreciate and look after. They can see the love, expense and passion which has been poured into the properties and really appreciate the details. In terms of communicating before bookings I now have in place a five day in advance policy booking policy, with the likes of Booking.com.